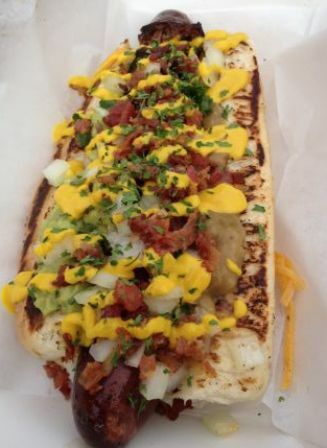 Rancho Cucamonga Grape Harvest Festival- I write a lot about owning and operating a hot dog business. One of the many opportunities that will arise is to sell your food at public events. It sounds good right? You talk to the promoter and are given the expected attendance and how many people came to the last event. You also ask how many food vendors will be attending. You don’t want more food vendors than people actually going to the event right? Then you ask how much for the spot and make a decision based on those facts. Well there is one more step you might want to consider and I know this is not practiced very much. That is to ask the food vendors who attended last years event how well they did. Sounds crazy and you may have to go through a few to get an honest answer, but its worth the time and effort as I am about to explain. Last August my company was invited to sell our food at the Rancho Cucamonga Grape Harvest Festival. We did the research, talked to the promoter and were told over 20,000 people were expected this year, and had about the same attendance in years past. This was after all the 73rd annual festival and was promoted in the local newspaper. The one piece of research we didn’t do was to find out who was at the event last year and ask if they were coming back this year. Big Mistake. What we found out after setting up and getting settled in was that all the food vendors were new this year. That’s a huge red flag! We also found out that on the first night of the festival that either the city or chamber of commerce had a huge tent in the middle of the food court and were giving out free food! Attendance that weekend was probably about 2000 people not 20,000. Every food vendor lost money that weekend. One vendor I talked to banked all he had on that event to pay his bills for the month. So a couple of points I want to make: If you are in my local area and are approached to do this event, kindly turn it down. Second, if you are asked to do an event even if its the 73rd annual do all your research and make an intelligent decision to attend the event or not. it will save you a lot of grief in the long run. In a previous post I wrote about people in America who risked their retirement or savings and bought a hot dog-cart. One thing they all had in common besides the obvious was no plan. They all did not go into business and plan to fail, they just failed to plan. So I thought I would create a series of posts about starting and running a hot dog business. The most important point is to plan ahead. Ask questions like will the cart I am looking to buy pass local or county health department codes? Most local or city governments do not communicate with the health dept. So what may be ok in your city might not pass with the health dept. Most of what I see on the internet is “Buy this cart and in a few days you too can be your own boss making money by selling hot dogs!” It simply does not work that way. Case and point: read this post about someone selling hot dog carts on eBay and not delivering. caveat emptor about anyone claiming to help you make it big in the hot dog-cart business. I have spent the last 6 years building my business up to where even in December and January we are busy. It didn’t happen overnight and I didn’t get it from reading some internet “Hot Dog Book”. New this year We have teamed up with trappersherwood.com and will be doing a series of interviews with successful hot dog-cart owners so that you can get some awesome info for free. In fact if you have a question you would like to ask contact me and I will make sure we put it in the interview.